My darling daughter, Hannah, is turning five years old tomorrow and I wanted to dedicate this week's Curtain Call Color Challenge to her. I found these amazing Mini Birthday Cookies at Lori's Place etsy shop. 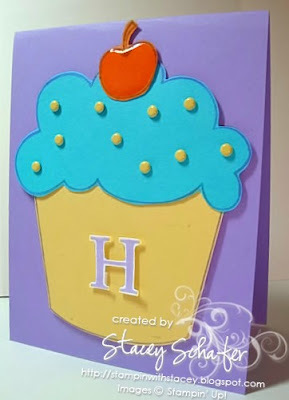 The icing colors reminded me of the Stampin' Up! colors, Tempting Turquoise, Lavender Lace, So Saffron, Pumpkin Pie, and Whisper White. Go check out Lori's Place to see many more holiday and themed favor cookies. 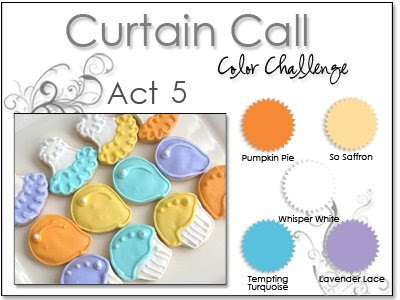 To play along in the Curtain Call Color Challenge Act 5, simply create a papercrafted project using these Stampin' Up! colors (or similar shades from other companies), post it on your blog or other public gallery (Splitcoaststampers, Paper Craft Planet, etc.) using the keywords Curtain Call, link your posting back here, and then come back to enter your name and URL in the Mr. Linky box. You have until Sunday, October 11th at noon (CST) to enter your project. I will once again be picking my FAVORITE(s) Curtain Call Color Challenge submission(s) that will be announced as the Curtain Call Show Stopper at the end of the week! Those who are chosen as Show Stoppers will receive this award to post on their blog and share the exciting news! I will be picking more than one Show Stopper each week depending on the number of entries there are. There will be awards given out for every ten Curtain Call Color Challenge entries! Here's the birthday card that I was inspired to make for my big five-year-old! What FUN colors!! Can't wait to play! Happy Birthday, Hannah!! Happy Birthday, Hannah! 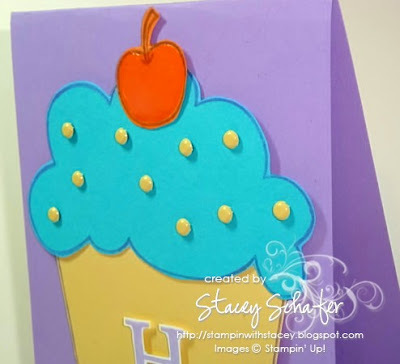 Stacey, I created a card this evening using this amazing color combo! Will photograph in the morning before work and post in the evening. great colors to play with Stacy, a big happy birthday to your daughter Hannah! This is a great color combo - thanks for the challenge! Thanks for the challenge Stacey, fabulous colours. And happy birthday to Hannah - hope she had a wondeful birthday!! I am very excited to participate!